Welcome to my Friday bonus feature called Karen’s Killer Fixin’s **Author Special**!! Today, in lieu of one of my own recipes, I’m going to introduce you to a new author who will share one of her favorite recipes. Not only will you and I occasionally learn how to make something new and delicious, but we’ll get a chance to check out some wonderful authors. 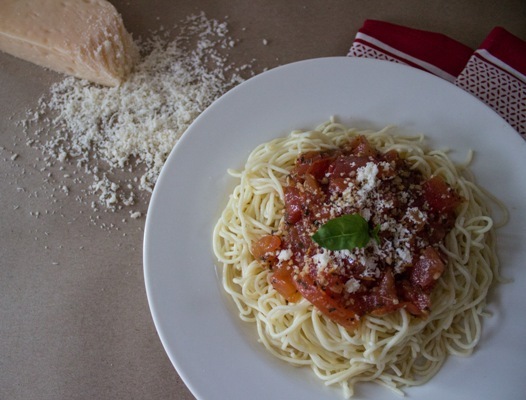 Introducing author, Brenda Novak, and her favorite recipe for TOMATO & GARLIC PASTA! New York Times & USA Today Bestselling Author Brenda Novak has written more than fifty novels. She is also a mother of five, and there is nothing that turns a woman into a fighter more quickly than a threat to one of her children. When her youngest son was in kindergarten, he was diagnosed with Type 1 diabetes. She’s spent the years since trying to juggle her career with the demands of providing healthy meals for her large and boisterous family, managing her son’s diabetes care and raising money for research. To date, she’s raised $2.4 million and is continuing her efforts with the sale of this cookbook, which includes her own personal recipes (all her healthy favorites) along with recipes collected from friend and co-author Jan Coad. Several years ago, when my best friend suggested I create a cookbook as part of my fundraising efforts, I jumped into the project with gusto. I’ve never considered myself a foodie, but I did believe that what I’d been forced to learn as the mother of a Type 1 diabetic, who also had four other kids to feed, might be of benefit to others who were in a similar position (or simply wanted to feed their family healther foods). It wasn’t always easy to prepare dinners that my whole family would eat—because that required food that was relatively low in carbs and tasted good, two things that don’t often exist together. LOL So I gathered the recipes I’d either modified or developed over the years, and I had my oldest daughter and her boyfriend help with staging and photographing some of the food, as well as taking pictures of our family. Then I ran into a roadblock. I had no idea how to figure the nutritional content, and if this was a cookbook designed to raise money for a disease like diabetes, it definitely needed to contain the nutritional information. 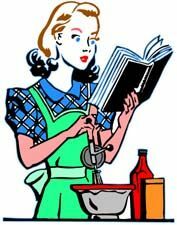 Not only that, but self-publishing wasn’t quite what it is today, so I would’ve had to find a publisher when I didn’t have a “platform” (anything to lend me credibility) in the cookbook market, since I’m a romance writer, not a famous chef. After a worthy start, the project slowed, and I put it on the back burner, hoping that the time would come when I’d be able to clear these hurdles, which happened nearly a year ago. A lovely woman by the name of Jan Coad contacted me on Facebook, said she used to own a restaurant and asked me if I’d like to do a cookbook together. Since I’d already started a cookbook, I jumped at the chance to learn more about her—and then I gratefully accepted her help and support. In December, she sent me her recipes as well as the nutritional information for them. Once Jan jumped in, it gave me renewed interest in the project, and I enlisted my middle daughter, who’d just graduated with an art degree, to help. We began cooking, staging and photographing not only the recipes Jan was willing to contribute but the best of the recipes I’d used to feed my large brood. That was when I realized how good Jan’s recipes really were. I felt like she was the missing piece of the puzzle, and publishing my cookbook would finally be a reality. But at that point, her son got sick and spent quite a long time in the hospital. I was worried about her and him, and I didn’t have anyone to figure the nutritional information of my own recipes. The project could easily have stalled again, but when I posted the fact that I was doing a cookbook on one of my writer loops, I had a fellow author—Elizabeth Johns—contact me to see if I needed any help. She explained that she was a dietician and could easily figure the nutritional content of any recipe. I was so shocked to have exactly what I needed drop into my lap that I couldn’t believe my good fortune! I sent her the recipes, and she responded very quickly with what I needed. Now, after months and months of hard work (my daughter also designed the book) at last, LOVE THAT! 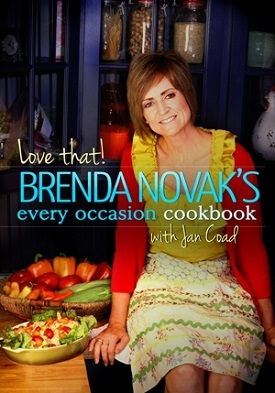 Brenda Novak’s Every Occasion Cookbook is finished and has just been released. Woo hoo! It contains 75 of my favorite recipes (we taste-tested every single one), with easy ingredients most people with have on hand and loads of pictures—all for the price of only $9.99 in digital. Print is a bit more expensive ($24.99), but every penny goes to fund such important research at the University of Miami’s Diabetes Research Institute, which I believe is our best bet for a cure. So I hope everyone will pick up a copy, enjoy the recipes we’ve used at the Novak household (and Jan has used at her household) and help all of those with diabetes at the same time. For more information on this cookbook and my other fundraising initiatives for 2015, including three limited edition digital boxed sets filled with BRAND NEW novels and novellas from some of today’s biggest authors, please visit http://brendanovakforthecure.org. I hope you enjoy the recipe Brenda is sharing with us today on Karen’s Killer Fixin’s. Happy eating! P.S. We’re at 200 recipes and counting with this posting. Hope you find some recipes you like. If this is your first visit, please check out past blogs for more Killer Fixin’s. In the right hand column menu, you can even look up past recipes by type. i.e. Desserts, Breads, Beef, Chicken, Soups, Author Specials, etc. Mince or press the garlic and brown it lightly in the olive oil. Add the tomatoes, the water, the seasoning and spices. Simmer uncovered for five minutes, stirring occasionally. Cook pasta and drain. Place in a serving bowl and toss with the sauce. Sprinkle parmesan on top of each serving. Serves 6 – 8. **SPECIAL GIVEAWAY**: Brenda is giving away a digital copy of LOVE THAT! BRENDA NOVAK’S EVERY OCCASION COOKBOOK to one lucky reader who comments on her Killer Fixin’s blog. Don’t miss the chance to read this book! Thanks, Brenda, for sharing your story with us! Good morning, Brenda, and welcome to Karen’s Killer Fixin’s! I’m so thrilled to be able to highlight your new cookbook. I admire your dedication to finding a cure for diabetes. My stepfather was diagnosed with Type 1 diabetes when he was 12 and had it all his life so I’m also a supporter. A cure must be found. Karen, thank you so much for being such a classy hostess. It’s always fun to visit your blog. How old was your stepfather when he passed? I agree–a cure must be found! It’s wonderful to have you with us, Brenda, but thanks for your kind words. 🙂 My stepfather was in his 40s. His disease was a challenge and difficult to control back then. We only had him for 5 years, but he was a real dad to me. I was eleven when we lost him. I’ve supported diabetes research my entire adult life. A cure will be found. I’m sure of it. I am very excited about this cookbook! Thanks for putting it together. It was a lot of work–a lot harder than writing a fiction novel. LOL But I enjoyed it. Thanks so much! I will have to try this recipe. Looks simple and delicious.